Reliance Jio is spreading its charisma for their new users now they are ready to give a bumper offer to Apple iPhone 7,6 and 5 on this festive season. If you're an Apple iPhone user then you are ready to enjoy everything for free from Reliance Jio sim. As they are offering free unlimited data, calls, messages for free for 12 months. This is only valid for new user of Apple i Phones. If you have recently bought Apple iPhone they are going to get chance to enjoy almost all the features of Reliance Jio. Jio has made a big announcement that they will provide their Welcome offer to new iPhone users for the next 15 months. Isn't its amazing having the latest iPhone and moreover of this you are going to get everything free from Reliance Jio sim ? After all having the world's best brand of iPhone and then getting the unlimited internet, calls and messages for free. However, If you are using Reliance Jio Sim with their Welcome offer then you are at least lucky to get this chance as in India all the other telecommunication companies have hiked their Data plan by 100-105%. And now under the program of Digital India Reliance Inc has made a great effect to Internet market and have made other companies to reduce their Data Rates. They are compelled to offer various plans to entice their existing users so that they couldn't lose their consumers. 1.If you have got an eligible iPhone then download the MyJio app from iTunes store. 2.Or if you have purchased your newly Apple iPhone from any Reliance Digital store, Apple authorized reseller or Apple premium seller then you'll get Coupon code inside the Apple iPhone box. 3.Now open the MyJio app on the Home Screen of the app you'll see "Get Jio Sim" option. 4.Click on the "Get Jio Sim" Option it'll generate an unique Barcode. 5.Visit any nearest Reliance Digital Mini Xpress Store along with Barcode and AADHAR CARD. 6.Now executive will do your eKYC and will provide you JIO Sim. 7.After this put your Jio Sim in your Apple iPhone. 8.Once your Jio Sim will be activated you'll be able to avail the free offers from Reliance Jio for 12 Months which will be valid up to 31st December 2017. 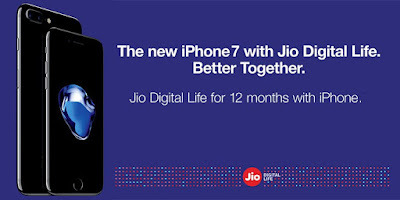 Jio iPhone offer is excursively for those users who have purchased their new iPhone on or after 7th October 2016 from Reliance Jio store or any Apple Premium Re seller Store. If you have already bought your iPhone then you'll get Jio iPhone Welcome offer.